With Visual Tarot You can: 1. Learn Tarot, Spreads, Decks, Meanings of the Cards (ideal for the novices); 2. Keep Your existing readings (made with original Tarot Cards) in the "Diary"(place like the database) in light-weight, easy-to-learn and crystal file-format! (this feature is aimed for professionals and enthusiasts); 3. 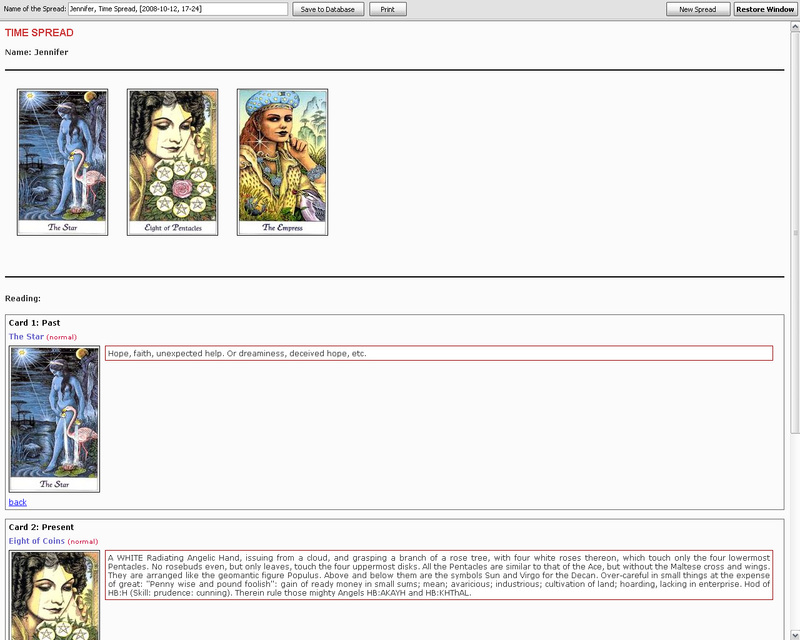 Make Visual Tarot Readings on the PC. Name, save and print the spreads and interpretations for later recall, along with date, your own notes and comments. The Show Report window (Reading window) allows you to instantly scroll through the entire reading, with images, before you print or save the report. Its view is fully customizable, You may choose what do You want to see there! You may install program to the hard drive of your PC or other mobile devices, for emaple, USB Flash Drive (or Card). Qweas is providing links to Visual Tarot Program 9.2.9 as a courtesy, and makes no representations regarding Visual Tarot Program or any other applications or any information related thereto. Any questions, complaints or claims regarding this application Visual Tarot Program 9.2.9 must be directed to the appropriate software vendor. You may click the publisher link of Visual Tarot Program on the top of this page to get more details about the vendor.